Indulge in some of Chicago’s uniquely crafted spirits on this all-inclusive distillery tour. Have samples at three local distilleries and tour one distilling production facility while being whisked around town in our one of a kind barrel bus. Our Prohibition-era experts will relive the trials and triumphs of the historical and modern day figures responsible for making Chicago one of the country’s best destinations for fine liquors! What better way to visit and taste at local craft distilleries than in a Prohibition-era styled barrel bus! Step on the bus through the speakeasy style, hidden vertical door to start your one of a kind Chicago Distillery Tour. 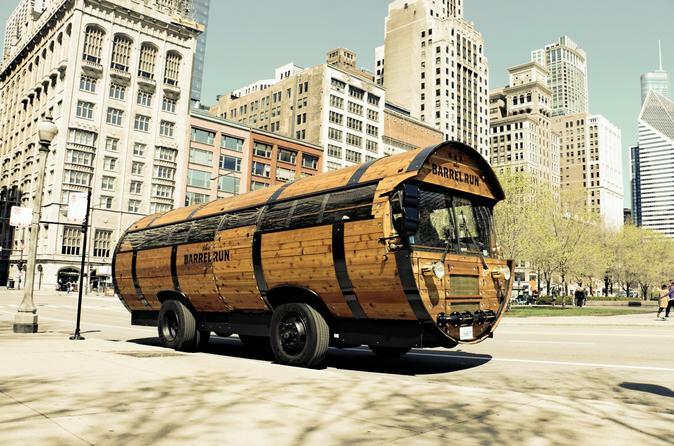 As you are taken from distillery to distillery in this jitney, your guide will provide an entertaining and educational insight of Chicago's liquor industry originating in the 1800's. Hear stories of George Remus, the man who owned many of the distilleries across America during Prohibition. Learn about the affect that Prohibition laws had on Chicago, and how certain gangs were developed to facilitate the transport of illegal hooch. At each of the three distilleries you will receive samples of craft spirits ranging from whiskey to gin, apple brandy, vodka, and more. Enjoy approximately 9-12 samples of different flavors of craft spirits along the entire tour. Each location has its own unique flavors to offer, and sample types vary depending on the locations visited. As you stop at some large and small facilities, you can get the sense of what it was like to step in a distillery back before the 18th Amendment made booze illegal. On the production facility tour, learn the step by step procedures of distilling and the science behind the process. Please bring your government issued photo ID. Your tour ends at the pickup location.